In Waldorf education, each day of the week has an associated colour, planet and grain. Rudolf Steiner called rhythm the 'carrier of life' and by marking each day with a colour, something visual and evocative, we help young children tap into the rhythm of their days. The colour for Thursday is Orange. 1. Crafty Fox Peg Doll, by Beetle and Fern. 2. Hand Knit Pumpkin, by The Sitting Tree. 3. 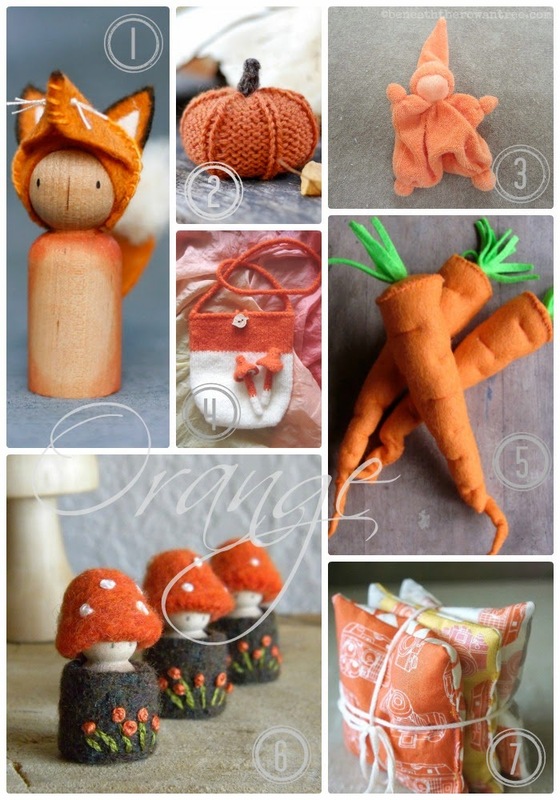 Orange Little Cuddle Doll, by BiBiDolls. 4. Magical Mushroom Wool Purse, by Lumbo Gimbo. 5. 100% Wool Carrots, by Bubba Pickles Market. 6. Waldorf Toadstool Tots, by Mama West Wind. 7. Sensory Lavender and Rice Beanbags, by Art Dexi. Oh, I Love all these items and I love that poem. Thank you for including my dolls! My pleasure! We actually ran across the poem in one of our books and it was perfect! There is a red one, too, but not as good!